Lessons & tandem flights are available everyday through Kitty Hawk Kites, the world’s largest hang gliding school since 1974. 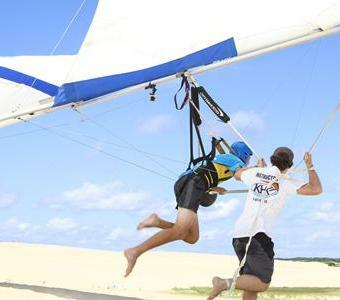 Make your dream of flying a reality at Jockey’s Ridge State Park, a savored slice of the same system of dunes where the Wright Brothers flew over 100 years ago. The soft sands and smooth winds make lessons fun and safe for students of all ages and fitness levels. After your beginner lesson, head north to The Cotton Gin for a high altitude tandem flight with an instructor. A breathtaking bird’s eye view of the Outer Banks awaits. 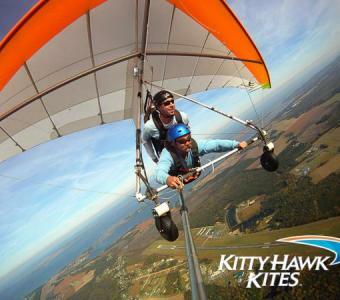 For more information or to make a hang gliding reservation, visit Kitty Hawk Kites' online reservations center, the first of it's kind on the Outer Banks. For additional assistance, please call toll free at 1.877-FLY-THIS (359-8447). For our history fans, come take a look at the Rogallo Wall of History located inside our classroom of the school. We are proud to share the history and legacy of Francis and Gertrude Rogallo. Cool down with an enjoyable ice cream treat while you wander the park, located inside our school. We offer a variety of treats, merchandise, and yes, even ice cream to cool down on those sunny days.